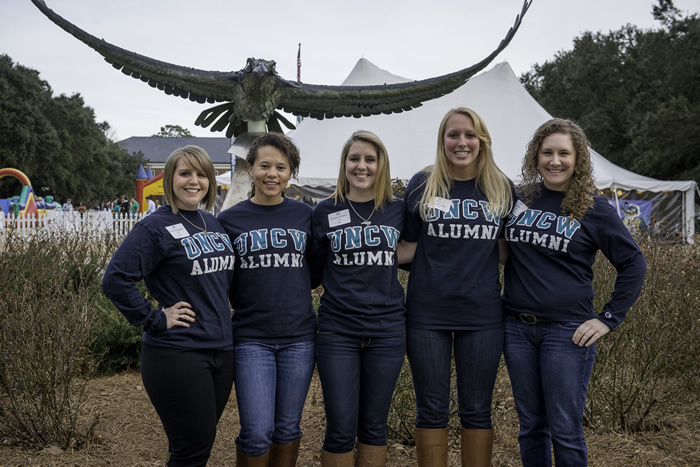 UNCW's Seahawk Territory Alumni Recruitment Team (START), helps continue a tradition of academic excellence by encouraging students to apply and attend your alma mater. As a member of START you can help provide the personal attention, encouragement, and UNCW stories that might make the difference between a student choosing UNCW or another university. This program is successful largely in part because of the alumni participation, and it is an invaluable element that allows UNCW to continue to surpass our undergraduate enrollment goals. The UNCW Office of Admissions & Alumni Association are looking for Seahawks to share their own undergraduate or graduate experience while meeting prospective students and families. If you are interested, SIGN UP TODAY! Members of START assist the UNCW Office of Admissions in recruiting academically-talented students for the university. Members range from alumni of a traditional undergraduate programs to parents of those same graduates. It is the personal Seahawk touch that the START program provides that oftentimes encourages a student to visit, apply, and ultimately accept an offer of admission. START members are asked to participate in a variety of recruitment activities each year. The average commitment for members is approximately 10 hours each year, and is based on the amount of volunteer opportunities in your area. While the volunteer opportunities may vary, we encourage you to share your ideas and thoughts on recruitment and become as involved as your time allows. It is important that all START members are trained and updated on any new UNCW information provided by the Office of Admissions when it becomes available. What is your most memorable UNCW experience? Describe relationships that you were able to develop with faculty, staff and students at UNCW. Do you have any advice for future Seahawks? "Take advantage of faculty and staff looking to invest in dedicated students. It is all about developing intentional, genuine relationships with others."